For our big traditional holiday feast each year, Steph and I usually go HAM (literally), but this year we’re spending Christmas a little differently, so I decided to look around on the internet for a smaller and easier alternative. One thing in particular stood out to me: Heston Blumenthal’s slow roasted rib of beef with bone marrow sauce. Heston’s recipes can often be a little sketchy, usually involving refrigerating things overnight or multi-hour sous-vide infusions, but this one is a super easy and classic looking recipe. Anyone familiar with cooking will think it’s a little ridiculous to call it a recipe at all, but it’s actually pretty innovative and awesome. Have you ever been stressed out making Christmas dinner? If so, this recipe is the answer. You can make it in the morning and ignore it all day long, and you’ll have your oven and stove for the other dishes nearer to dinnertime as well, comforted by the thought that the meat is perfect and waiting for you. The basic premise is to slowly raise the temp of the meat to your final desired doneness and then rest it thoroughly. It’s taking the usual steps of browning, roasting, and resting, and going all out, allowing the meat to relax and retain maximum moisture. 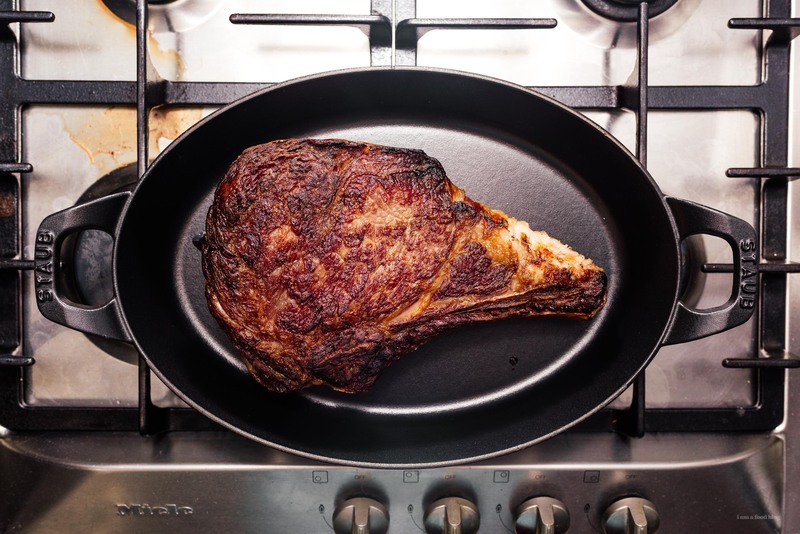 When you roast it this way and slice into it after resting there is almost zero liquid released – it’s all in the beef. The best part of it is that you can make it completely in advance and relax before dinner. It doesn’t take up any oven space or burner space, freeing you up to make the all important sides of your meal (we went with mashed potatoes and yorkshire puddings for those). All that was needed was to brown the meat in the morning, which took about 10 minutes, and then transfer it to an oven set to 140°F. After it hits temp, you take it out and rest it for at least an hour, and personally I just left it all the way until dinnertime. It took about 3 hours for our 2.5lb prime rib roast to come to 131°F/med-rare, although next time I would probably cook it to 140°F sharp. 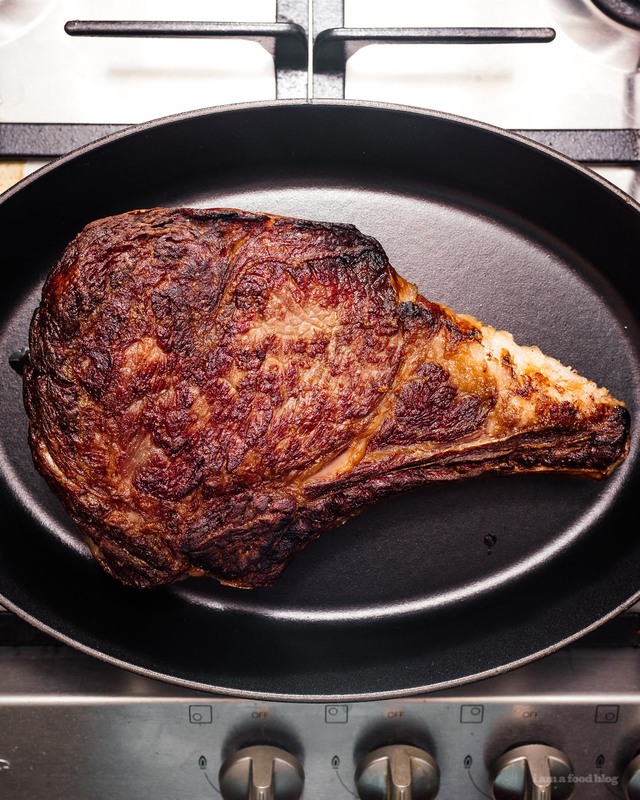 The meat was so juicy it didn’t need to be that rare, and more doneness would have boosted the flavor of the fat (that’s always the tradeoff when you are going rare – with A5 wagyu they always recommend at least medium). A larger roast will take up to 5 hours to get to temp, so you should plan accordingly. Go with half a pound per person, including the weight of the bone, and adjust the time accordingly. 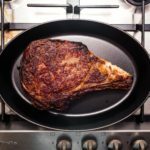 I used a wireless meat thermometer, which is the best <$20 you’ll ever spend on cooking as it takes all the guesswork out and guarantee perfect meat every time. You can make this recipe for any doneness as well, by just heating your oven to 10° higher than the doneness you’d like. 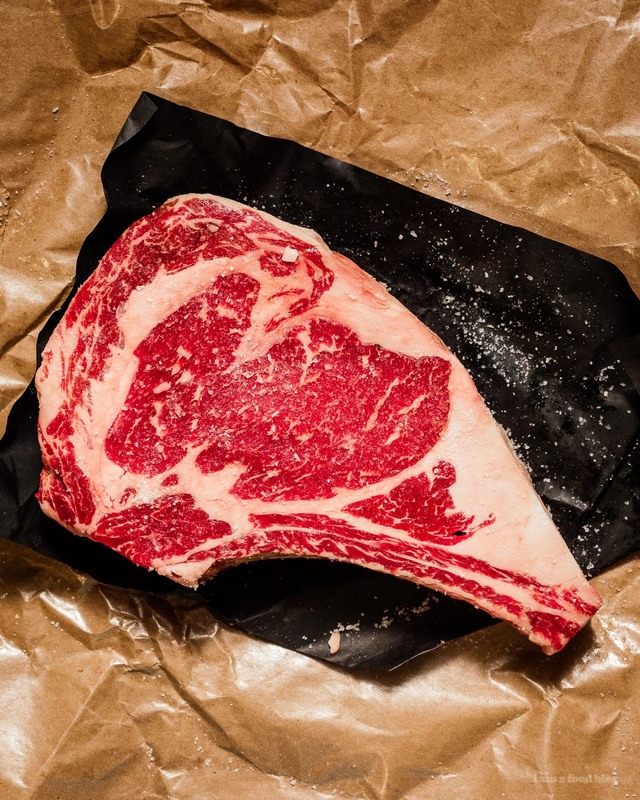 Overall it was an amazing way to cook meat – easy, low stress, and didn’t use up any space. You’ll notice I didn’t mention the bone-marrow sauce, and that’s because it’s a diminishing return for the effort it takes to reduce all the components and find bone marrow. The meat was wonderful with just salt and pepper. Preheat your oven to 140°F. 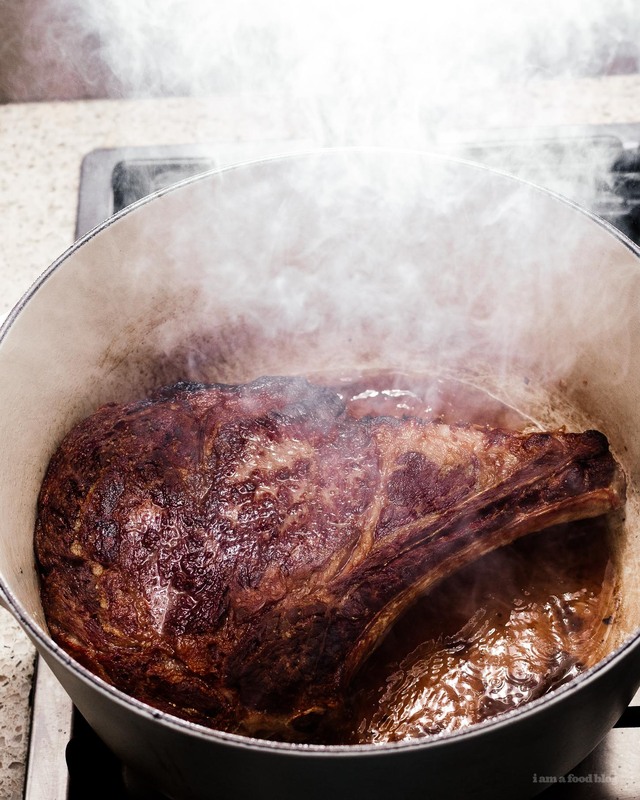 Heat up a heavy stockpot until it is almost smoking. Add a generous amount of oil, about 2 tablespoons, and allow the oil to get hot and almost smoking. Season the beef generously with salt on top and bottom and then deeply brown the beef on all sides (including the edges). Transfer to a roasting pan and roast until the deepest part of the meat reaches 130°F (or your desired doneness) – about 3 hours. Remove and let rest for at least an hour or until ready to serve. Slice off the bone and cut into triangular pyramids. Serve with salt and pepper and sides. This will work at 170 as well, the key is to have a temperature probe tell you when the meat’s hit temp. One Bowl Pumpkin Cupcakes with Brown Butter Frosting Recipe + A KitchenAid Giveaway!